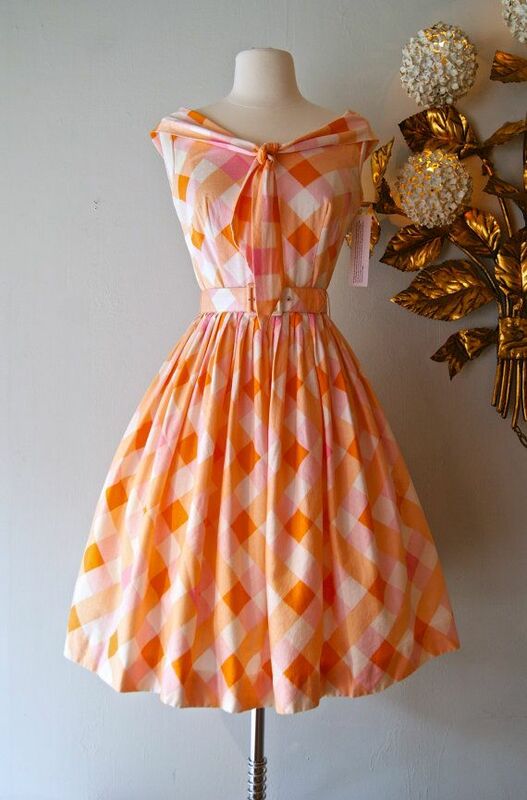 I recalled this adorable dress I'd found on pinterest some months ago. After some voting and digging I decided to go ahead and try my hand at it and found the perfect springy/summerish material. 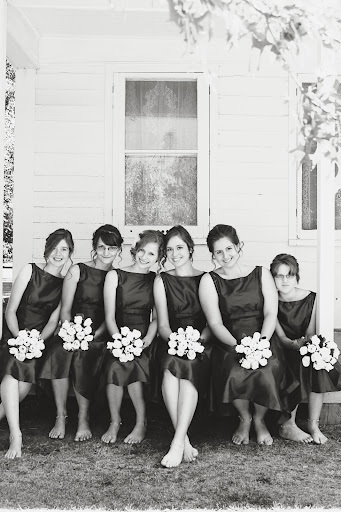 I used a very simple bodice pattern - Simplicity 1873. Size 12 fit almost perfect I did have to take like 2 inches out on the side seams, but the rest fit.. lol I hate that I have to make such big sizes these days. Lawd. The front "scarf" detail is just 4 ish inch wide strips cut on the bias. And the ends are angled. It doesn't cap my shoulder quite` like the original seems to be, but alas I am happy. The skirt was 3 panels the full width of my fabric so probably around 125" circumference. Simply gathered at the waist. The back collar was a bit trickier just because I was careless and got one point way longer then the other. Making the piece itself wasn't to bad - just made angled lines and away we went. I whipped the dress out in about a day. The crinoline however took a tad longer mainly due to cutting and procuring the materials. I set my hair in sponge rollers the night before. I was extremely pleased with the result. All I did was unroll them on the way to school and ruffle the crown of my head up a bit to be rid of any disturbing partings and threw on bit of firm hold hair spray. These pictures were taken after a full day of wear. So needless to say the curls stayed in fabulously. The crinoline is 3 layers. 3 tiers each. The bottom tier is 8 yards in circumference, the 2nd 4 yards and the top 2 yards. I was unsure if it was full enough - mainly at the top. I wanted a nice feminine bell shape rather then a triangle. After seeing it all together I think its satisfactory. Its obviously very simple in design. This is the original I was aiming for. And this tutorial is very very similar... Certainly wasn't my favorite thing to work on. So monotonous and the amount of ribbon & thread I used was unbelievable! My beloved Aris Allen dance shoes! Love them bad boys - makes me so happy everytime I get the opportunity to break them out. Pearls of course. They seem so cliche, but totally completed the ensemble if you ask me. I took a very simplistic approach with my make up. Super light blush, 2 different shades of light brown eyeshadows, and Rimmel gel eyeliner which is the best thing ever for wings and such. I did fill my brows a bit believe it or not. I'm apparently not capable of having high arches tho. Which is rather dissapointing. lol I somehow managed to loose my red lipstick during the night so I was forced to improvise alittle till I could get my hands on some. And then I walked out with 3 different ones cause I couldn't decide which shade I like best. lol Girls problems...I swear. Anyhow this is super helpful for someone who wishes to achieve something similar. And that's that. I now have a cute, fluffy little 50's dress to wear anytime I please!!!!! It was a great success at school as well. Yay for a victory! This dress has certainly been one of dread. From fitting trials to my little brother chopping into a piece I didn't have any material to replace it with to getting black nail polish on the front of the bodice...Oi! I've nevermore been so happy to have something concluded. But after all the longer the wait the more jubilant the inauguration, no? The material is a reproduction print. I can't remember exactly who made.. :-/ lol Needless to say I've been working on this gown for quite sometime. If I recall correctly I used Past Patterns 702 as a base for the bodice. Lil sis and I spent hours fiddling with the fit. We had to re-cut the armsyce quite alot. Let me just say that's no fun. We also re-positioned the side and shoulder seams. And just downsized it in general. I'm still not quite satisfied - I believe it needs a tad of padding around the front armsyce. But its a huge step up from where I've been, seeing as I've previously not had any of the proper lines. I daresay I absolutely adore having a dropped armsyce as restricting as they can be. 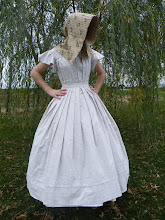 I used tucks for the waist treatment on the front bodice. I only had enough ease for 2 very thin ones, but alas they do the job on my less then slight bust. 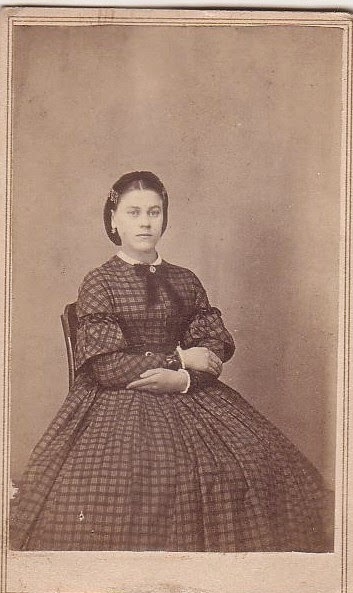 The skirt has layered directional pleats. I thoroughly tried to be sure all the stripes were making a pattern. I of course used a deep hem facing. Those can be life savers for sure. I also employed wool hem tape for the first time. I'm totally in love with it!! 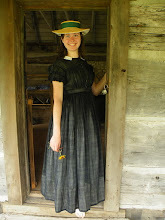 The sleeves are made using a basic slim sleeve pattern - the simple sloper that I base most of my 1860's sleeves off. The bottom section is cut on the bias to allow for alittle extra movement seeing as they are rather snug. The puffs are just rectangles with alittle chevron action going on with some of them because I ran clean out of fabric and had to piece all of the them. There is like 8 or so pieces for each sleeve. Directional stripes are no longer my friend. lol ;) I also did some extreme piecing to have enough piping for the neckline, armsyce, cuffs, and the bottom of the waistband. And then the little details that seem to enhance the whole ensemble and make it look properly integrated! The belt is silk taffeta. I first cut a strip of cotton duck the width I desired my finished belt to be. Then I cut the taffeta wide enough to wrap around the duck, plus 1/2 an inch to fold under. Next I whipped one long side of the taffeta to the center of the duck and wrapped it around folding the other long edge under 1/2 an inch and whipping it down over the previous side. Lastly my faux gutta percha reproduction earrings made by Mandy Kallal. I love those things. They complete the ambiance in my humble opinion. The week of my sister's wedding she decided she needed a couple new dresses to wear during her new married life. 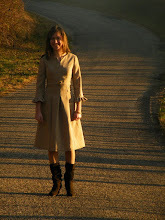 Sometime ago she made a little black dress using Simplicity 3673 - 1950's Retro. It became a staple - suited her perfectly and she got many many compliments on it. Thus, in regards to that she concluded that would be a good pattern for us to use. Seeing as we were frequenting Hobby Lobby plenty often for last minute wedding bits...we took the opportunity to pick up a couple fabrics (both which ended up being polka dotted) and trims. As you can see we fiddled around abit and she came up with some clever trim placement. I'm no good with such things, however, I like to think my stupidity inspires it. After some confusion over what size the previous dress was made. I had to take in the sides a considerable amount. That's always most discouraging - finally completing the finishing touches and excitedly having the recipient try on the garment only to find it doesn't fit properly. Never the less that's all part of being a seamstress. It happens, and we must overcome the issues and contrive a beautiful piece. Such a lovely cake! Josiah's mom made it. As well as all the cupcakes! We put together the jars with burlap ribbon and twine for the centerpeices. That was a fun time. Chicken Noodle Soup was playing loud enough the jars were vibrating together. Yay subwoofers. lol Anyhow, add in a couple old books, a few skeleton keys, some flowers, rocks, water, and floating candles! Purty stuff. There was much dancing to be seen! Our adorable friends Larry and Shirley - who we had the pleasure of meeting thru reenacting! All to soon they were on they're way...the tear down began and home we all ventured.